NYC Educator: "I’m going to fire somebody in a little while. Do you want to see that?" "I’m going to fire somebody in a little while. Do you want to see that?" So speaks uber-"reformer" Michelle Rhee to a PBS camera crew. Apparently, this is something Rhee takes pride in. I guess I'm not made of whatever Rhee is. On the few occasions I've known people losing jobs, I found it deeply disturbing. For me, it really had nothing to do with whether or not the people deserved it--as a human being I can't help being upset by seeing others lose their livelihoods. Rhee has no such reservations. That's a good thing, because under her tenure, almost half of the DC education staff either left or was fired. 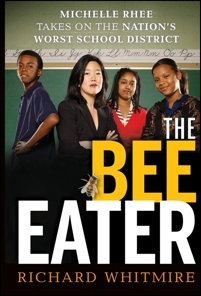 Diane Ravitch, in reviewing Richard Whitmire's The Bee Eater, points out that Whitmire sees her contract offer, getting the "best teachers" to give up tenure for a raise, as her prime accomplishment. Ravitch further notes that Whitmire seems to have forgotten that 40% of teachers declined her offer, retaining their due process rights. Had I the patience to wade through a book-length piece of propaganda (and God bless Ravitch for saving us the trouble of doing so), I'd be curious how many of the 60% retained their positions. I wouldn't want to depend on the propagandist for accurate information, though, as most readers of this book likely did. I'd also wonder how much extra money if would've taken to get them to sell their immortal souls. What's the going rate in a down economy? Surely a competent devil would be making deals left and right. How else can you explain the proliferation of subhuman demagogues like Rhee, or the gaggle of propagandists and wannabe "reformers" who lap at her feet? What do they have to say about scandals like Erase to the Top, perpetrated in Rhee's DC just as the so-called Texas Miracle was touted by another artificially produced education expert, GW Bush? Here's what the propagandists do--they wait and hope the public forgets. That's proven a pretty fair strategy. Despite what happened in Texas, Americans were all too willing to accept the notion of miracles from Bloomberg, from Geoffrey Canada, from Davis Guggenheim, from Bill Gates, and from Rhee, she who prefers to be identified with her broom, rather than her more relevant eraser. What on earth will it take for we, the people, to wise up to such nonsense?